The most routinely-seen color in the breed and definitely the most striking! Black is dominant to all other colors. Sometimes, Pencilling will occur on the chest. It is advisable to breed away from this tendency. If you are in need of sexing offspring as soon as they hatch, this is the color for you! There is a lighter "chocolate" that is actually the chocolate gene combined with the buff gene. This isn't necessarily a sign of cross-breeding, it comes from the breed's origin. 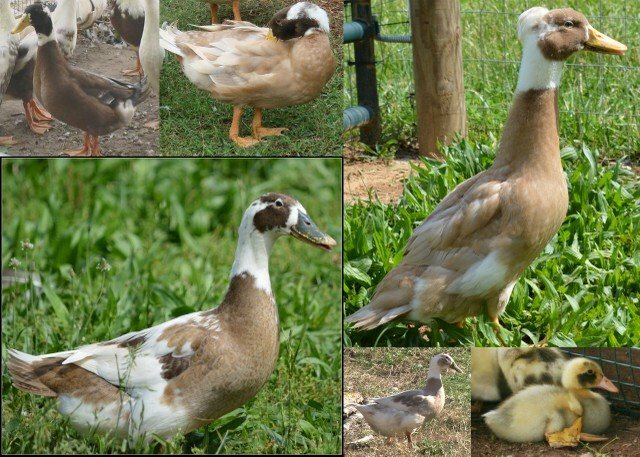 I haven't had the opportunity to find out if it is an "accepted" color or one to breed away from. I will warn that it CAN show up in this breed. 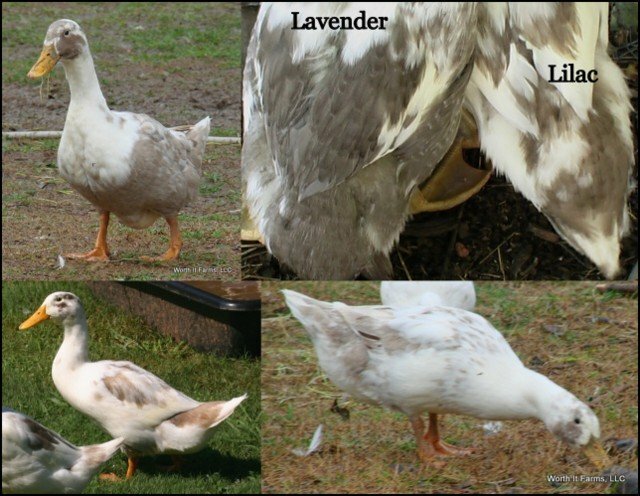 Lavender is a deep purple-grey color that fades before molting and with age. 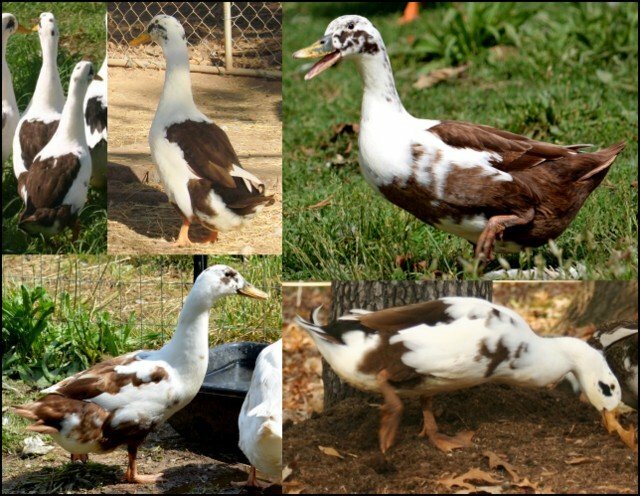 Genetically, these birds are a combination of the Chocolate gene and one Blue gene. Sometimes the Chocolate gene will bleed through, producing isolated Chocolate feathers scattered in the Lavender ones. Similar to Lavender, but distinctly lighter when young. This color is the result of the Chocolate gene and Two Blue genes. Another way to think of it: Silver with Chocolate. Easily confused with Lavender. Breeding trials, a skilled eye, or both may be needed to differentiate. Blue is incompletely dominant (one copy of the gene gives you blue, two gives you silver). The genetics act the same as Black/Blue/Splash in chickens. 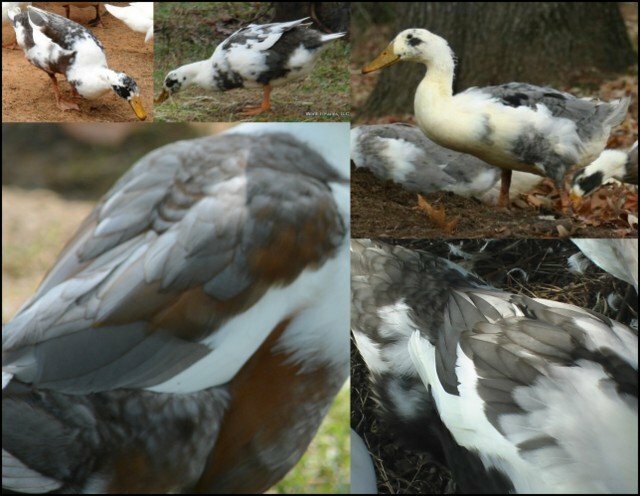 Especially well marked Blues will develop a red/brown rust on their chests (even blending into their shoulders and belly), this is not a fault as it is in other breeds. It's merely par for the course. Like Lavender & Lilac, Blue can have "bleed through" from the black gene, resulting in black feathers scattered on Blue feathers. Silver is still the rarest color. It is a double recessive; a dilute of blue. Same as "splash" in chickens. Visually, they are a very light grey which is typically scattered about haphazardly. They have more of a blue undertone, whereas the lavender/lilac has a brown undertone. We are working on having more of these available that are well-marked. Tricolor is the combination of any two colors and white. Because Ancona's were developed using Runners, any color found in Runners will be expressed in Anconas. Typically the Extended Black gene hides most of the colors. 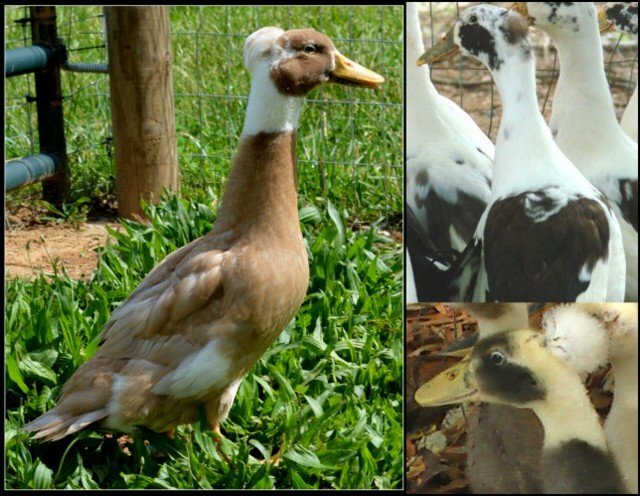 When you remove the Extended Black gene (as happens 25% of the time when breeding two very well marked, (ie. 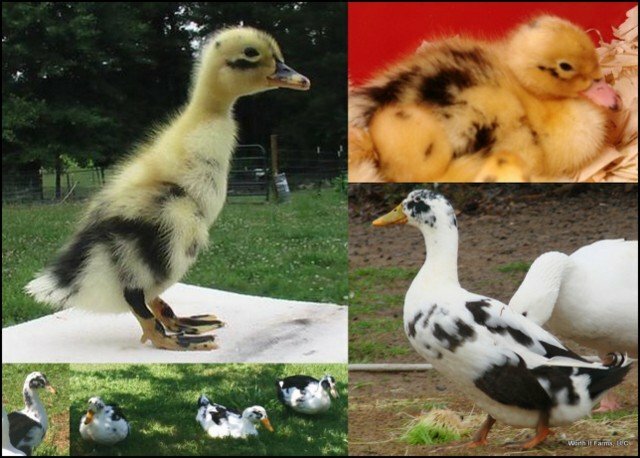 heterozygous) birds together), the underlying genes will be visible. We have had several tricolors produced this year, but I doubt we've even scratched the surface of possible outcomes. For now, we are having tricolors pop up in Emery Pencilled, Blue Fawn Pencilled, Fawn & White, and a few others I haven't yet identified. This occasionally occurs in black ducks. It is to be avoided when possible. This isn't a color, it's a characteristic of the pattern. Seen in black, chocolate, and blue, it will take on different appearances in each color. As stated above, it's not a fault, just "par for the course". The best-marked black and chocolate birds will have a "beetle green" sheen on their feathers. These are the "keeper" birds. 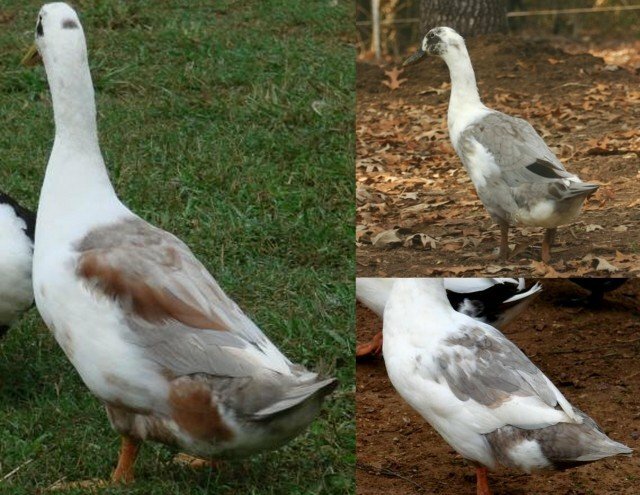 The most common place to see this sheen in action will be the Cayuga or Black East Indies duck. Both are known for this beautiful coloring. 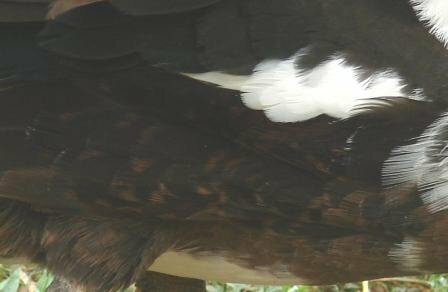 Pictured is a Black feather showing the sheen.